Hit 'Refresh to feel fatigue-free and look glowing in an instant. 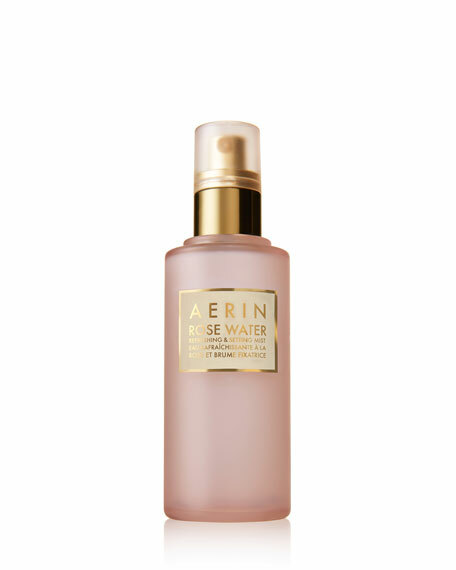 This milky, lightweight emulsion with AERIN's exclusive Rose Complex helps soften, hydrate and energize. Use on bare skin or to help set makeup with a flawless finish. The quickest route to dewy, healthy-looking skin: Spray on after cleansing to hydrate and envelop skin in moisture. Mist lightly over makeup to set and add a glowy finish. Reapply on the go for a boost of refreshment. Travel-ready. Dermatologist and Ophthalmologist-Tested. Non-acnegenic. Avoid spraying in eyes. Hold bottle about 12 inches from face and spray evenly, with eyes closed.